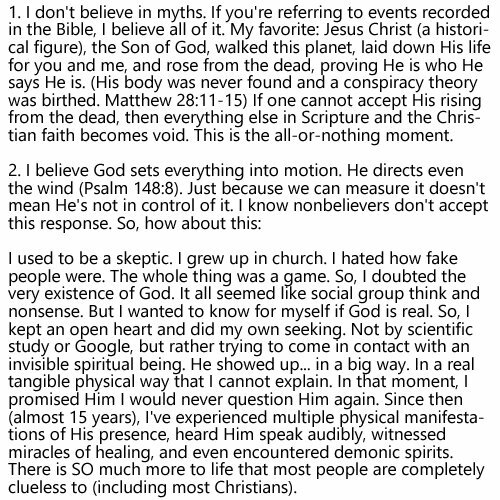 @aBolderFaith’s answer to the Theist Challenge. 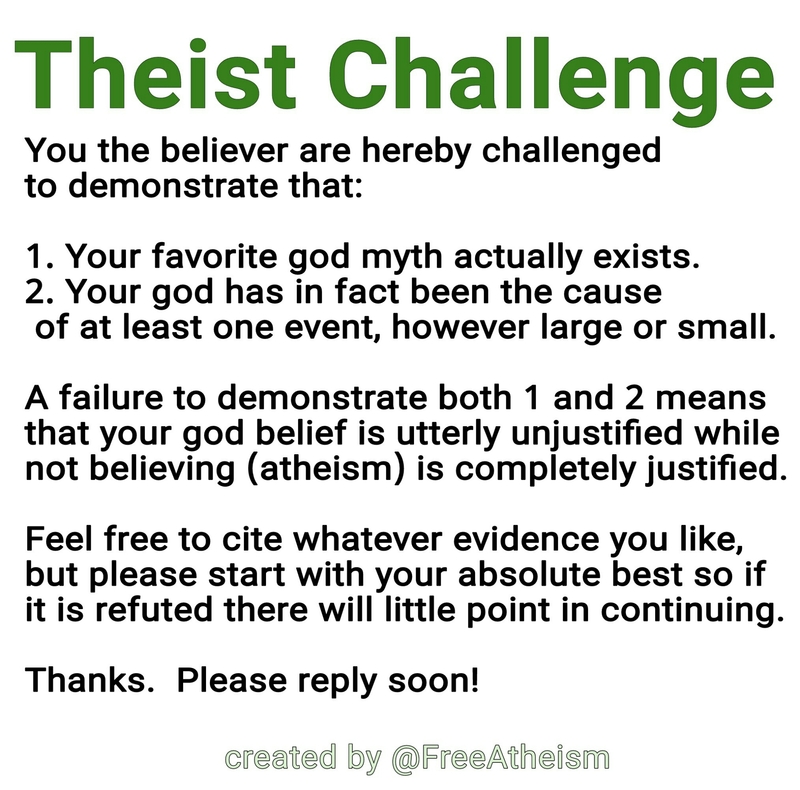 Below is the #TheistChallenge I posed to @aBolderFaith on twitter. Thanks for answering the challenge @aBolderFaith! Your concern was “Your test is biased as is the way it will be scored” but unless you are saying that using logic, reason & a fair standard of evidence is biased, it won’t be. I will attempt to explain why your submission doesn’t demonstrate a God (or gods or divinity). Referring to your #1, you do in fact believe in myths as being real. The divinity of Jesus is a myth, as its not proven to be fact in the bible or by historians. He is not considered an historical figure as depicted in the bible, but rather some historians agree some ancient holy man (or men) might have been the basis for the bible stories. Nothing even close to evidence verifies his miracles to have ever happened. This can be tested. Not one person noted or wrote down the 3 hour eclipse for example. Not one person noted the mass resurrection in town either! These are things any and all local historians (or anyone) would have documented. Its nowhere but the story of Jesus, which makes all aspects of it VERY dubious. There’s no good reason to believe the whole death & resurrection event even happened beyond pure fiction. So citing the missing body as evidence is like saying Harry Potter’s missing body is evidence of his resurrection power… it happened in fiction only. Correct, per your #2, citing mythical claims from a mythical book isn’t convincing. Most likely, your cognitive efforts to find a godly type being was entirely internal. You conditioned your brain to find exactly what you wanted to find. Its self brainwashing. The brain is powerful that way. It will help you complete a delusion by filling in gaps with feelings and experiences, all while letting you forget what doesn’t fit. This is one valid explanation for what you experienced. Another problem with your experience claim is that you’ve not verified the source of your visions & experiences. For example, if you have a visions, feelings, experiences & see miracles… all depicting the Faerie King… Does that prove the faerie king is real? Of course not. A vision’s contents need not depict the CAUSE of the vision, so no, these experiences (even if real) don’t demonstrate the cause you pretend that they do. Sorry. So to sum up, thanks for answering the challenge, but after fairly assessing it as evidence, it doesnt demonstrate your God myth to be real. Atheism is still the justified position.